Dr. James Parrish says the ORBERA™ Managed Weight Loss System offers patients a new, less invasive way to fight obesity and start living a healthier lifestyle. Alexandria, LA – A new weight loss option is rapidly gaining popularity, and it utilizes a unique system of tools to help individuals lose weight and live healthier lifestyles. 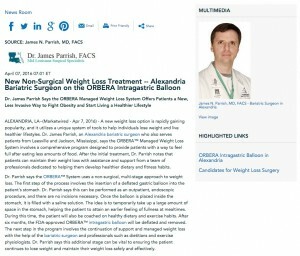 Dr. James Parrish, an Alexandria bariatric surgeon who also serves patients from Leesville and Jackson, Mississippi, says the ORBERA™ Managed Weight Loss System involves a comprehensive program designed to provide patients with a way to feel full after eating less amounts of food. After the initial treatment, Dr. Parrish notes that patients can maintain their weight loss with assistance and support from a team of professionals dedicated to helping them develop healthier dietary and fitness habits. Dr. Parrish says the ORBERA™ System uses a non-surgical, multi-stage approach to weight loss. The first step of the process involves the insertion of a deflated gastric balloon into the patient’s stomach. Dr. Parrish says this can be performed as an outpatient, endoscopic procedure, and there are no incisions necessary. Once the balloon is placed inside the stomach, it is filled with a saline solution. The idea is to temporarily take up a large amount of space in the stomach, helping the patient to attain an earlier feeling of fullness at mealtimes. During this time, the patient will also be coached on healthy dietary and exercise habits. After six months, the FDA-approved ORBERA™ intragastric balloon will be deflated and removed. The next step in the program involves the continuation of support and managed weight loss with the help of the bariatric surgeon and professionals such as dietitians and exercise physiologists. Dr. Parrish says this additional stage can be vital to ensuring the patient continues to lose weight and maintain their weight loss safely and effectively. The ORBERA™ Managed Weight Loss System is designed for patients who are age 18 and over with a body mass index (BMI) in the 30 to 40 range. Dr. Parrish says this non-surgical weight loss treatment has shown a lot of promise. A 12-month clinical study of the program showed that many patients experienced a 21-pound weight loss while the balloon was in place and were able to maintain significant weight loss for at least six months after the balloon was removed. Dr. Parrish notes that the ORBERA™ Managed Weight Loss System offers patients who have not achieved success with traditional diet and exercise regimens and who desire a non-surgical treatment for weight loss an advanced new option to attain their goals. A board-certified General Surgeon, Dr. James Parrish previously served as the President of the Louisiana Chapter of the American Society for Metabolic and Bariatric Surgery (ASMBS). Dr. Parrish is a Fellow of the ASMBS, a Fellow of the American College of Surgeons, and a Member of the Society of American Gastrointestinal and Endoscopic Surgeons. He serves as the Medical Director of Bariatric Surgery at Central Louisiana Surgical Hospital and Christus St. Francis Cabrini Hospital. In addition to the ORBERA™ Managed Weight Loss System, Dr. Parrish offers a comprehensive range of surgical weight loss procedures at Mid-Louisiana Surgical Specialists, including gastric sleeve surgery, gastric bypass, and adjustable gastric banding. Dr. Parrish is available for interview upon request.